Digidirt's carbon chainring weighs 25-percent less than a comparable alloy model. 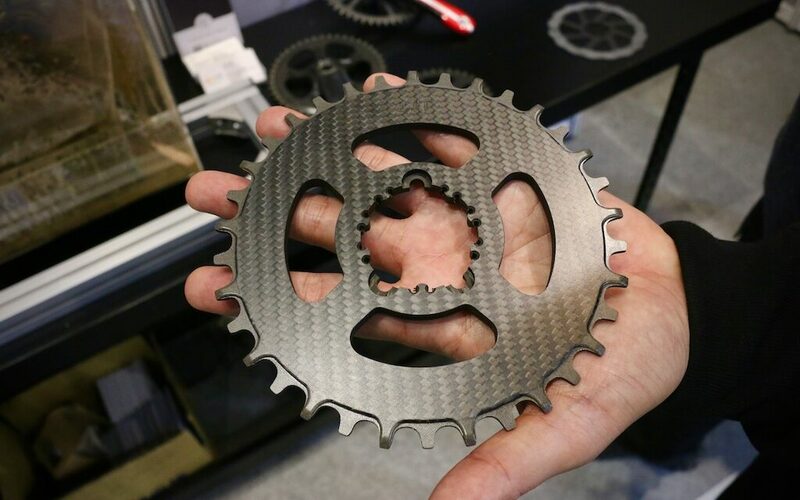 Carbon fiber chainrings might look like they’re from the future, but it’s something that’s been done before with limited success. As you’d probably guess, having a steel bicycle chain running over teeth made of carbon fiber doesn’t end well in the long run, but Digidirt says that they have a solution. The answer, I was told, is a special metal coating on the narrow-wide teeth that’s said to prolong their life to match that of an aluminum ‘ring. 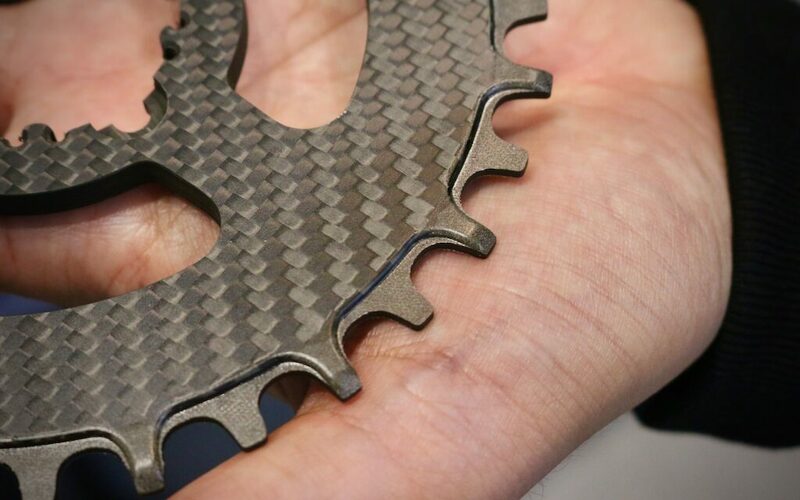 Coating carbon with a thin layer of powdered metal is being done in other industries and a proven tactic, but it’ll be interesting to see if Digidirt has the answer for us mountain bikers. Weight? It’s low, of course, with the mountain bike versions coming in around 25-percent lighter than an aluminum ‘ring of the same size. Cost? It’s high, of course, but not as high as you might think. If you want a new one from SRAM, expect to pay around $100 USD, and if you want a carbon ‘ring from Digidirt, it’ll cost you about $150 USD, depending on the size. The version pictured here sports a SRAM direct mount pattern, but there are all sorts of other mounting options as well. See that grey coating on the narrow-wide teeth? That's said to prolong the 'rings life to match that of aluminum chainrings.